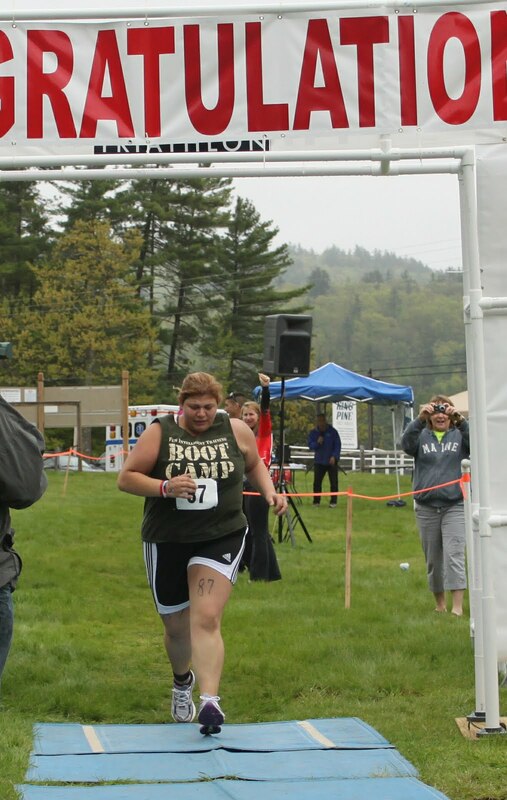 A Fat Girl's Ironman Journey: A New Triathlete! I've had an abundance of whiny posts lately. Yea, I want to explain to people some of the issues that we zebras face, but ya know what? That's not what this is all about! It's about overcoming adversity, facing fears, attacking life full on and with a smile. I met a woman at the King Pine Tri this weekend that just reminded me of all of these traits! It was a good weekend! The weekend was a different one for John and I. We decided last minute to get away, do the tri again and go back to the LazyDogInn which is a bed and breakfast that caters to those of us with dogs. This place just rules! Last time we were there we had Gemini, so we were a little sad but within minutes Apollo made 3 new friends. 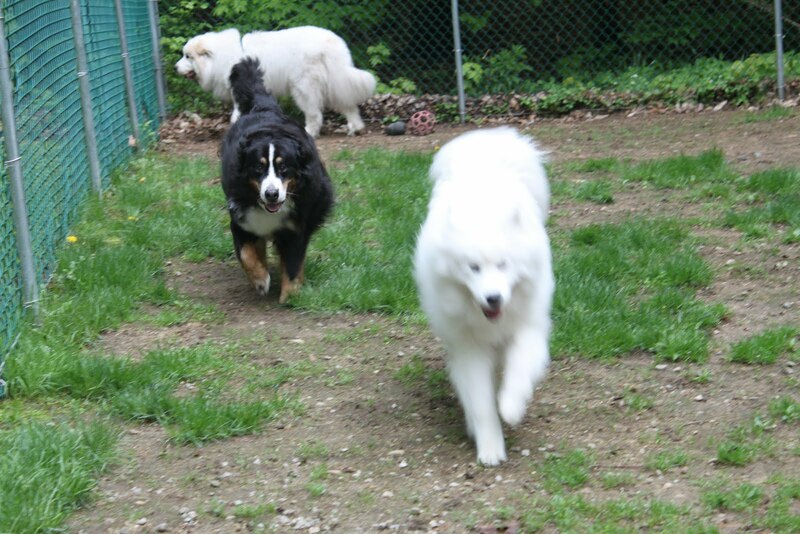 Moe, Lilly, and Czar. They played and played and played, he was not ready for the race the next day! When the alarm went off, he actually stayed in bed! The weather reports were iffy, I wasn't sure if the sun would come out or not. Unfortunately NO would be the answer! We arrived early, John and Apollo got a great spot for picture taking and I got into transition first! Time flew by and soon it was time to put on the wetsuit and freeze to death. 57 degree water and no sun make for a pretty cold day! I made my way down the pine needle path, luckily I remembered from last year, and wore booties! I giggled at others who were doing the "ouch ouch ouch" dance! I found the orange caps and bumped into a woman who I overheard say "eeh, I'm really nervous it's my first Tri." I thought to myself "good gravy, this is a COLD @ss tri to be doing your FIRST one, not to mention it's in the MOUNTAINS.. YOU GO GIRL".. so I started talking to her. You all know me. I'm all about talking (yea you know you want to end it there).. I'm all about talking people off the swimming fear ledge. Nothing to fear, just the same as training day, just more people! She then told me she just lost 100lbs and this was her treat to herself. HOLY CRAP! Again YOU GO GIRL! Since I've started writing this blog, People have contacted me with some amazing stories like this, but Christina is the first woman I've met in person! What an inspiration. You could see the pride in her eyes. She just wanted this so bad, yet had this tingle of "fear", but it wasn't really fear in her eyes! I would say it was "fierce." My race was okay. I thought about her, wondered where she was. I figured she wasn't far from me. The course is pretty hilly, it's in the MOUNTAINS. But the nice thing is the downhills were very visible and you could GO GO GO, so I had some fun cranking 30+MPH and semi-imagining crashing. I rounded the last turn and saw John (sitting in Poision Ivy so he told me later). Ok only 3.9 miles left to RUN.. ICK! - not a 5K but I knew this, I did this race last year. It is quite a nice run, through the cross country ski trails and around the lake. 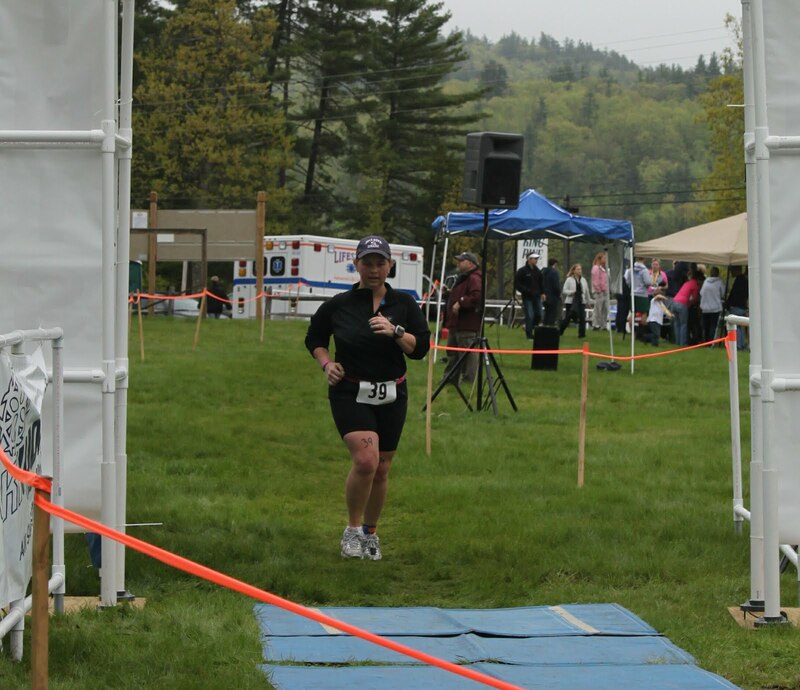 The boy scouts manned the water stops, the little ones are so cute running out to you "Water? Vitamin Water? " 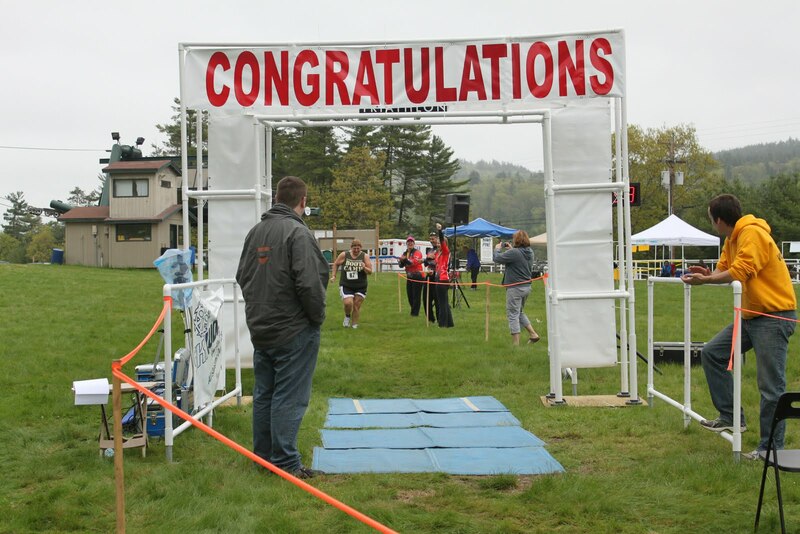 - Don't forget to thank the volunteers at races! The boy scouts just looked at me funny when I thanked them though. Vince, the Chi Running Master is the race director so I was REALLY focusing on my chi running. There were a few times that I really 'found it' I was like "HEY THIS IS GREAT" only to look down at my Garmin and see that my pace was an 18 min mile HAHAHAH.. ok maybe I didn't find it! For those of you who don't race, here's a secret. Our AGE is listed on the back of our calf..... I say this because as I got further in the race, OLDER AND OLDER people kept passing me. As I passed the last boyscout, this 74 year old man BLEW by me. I'm not talking just "hey how ya doin" - I'm talking "EAT MY DUST" - -damn! He won his age group. (no one else in it though). Another awesome dude I must say! I finally got back out to the street, crossed to the ski resort and the announcer had decided to stop announcing people. That's one of the pretty annoying things about being 'close to last.' (that and they often pack up the 'free food' before you're done)... I crossed the finish line and got my medal. 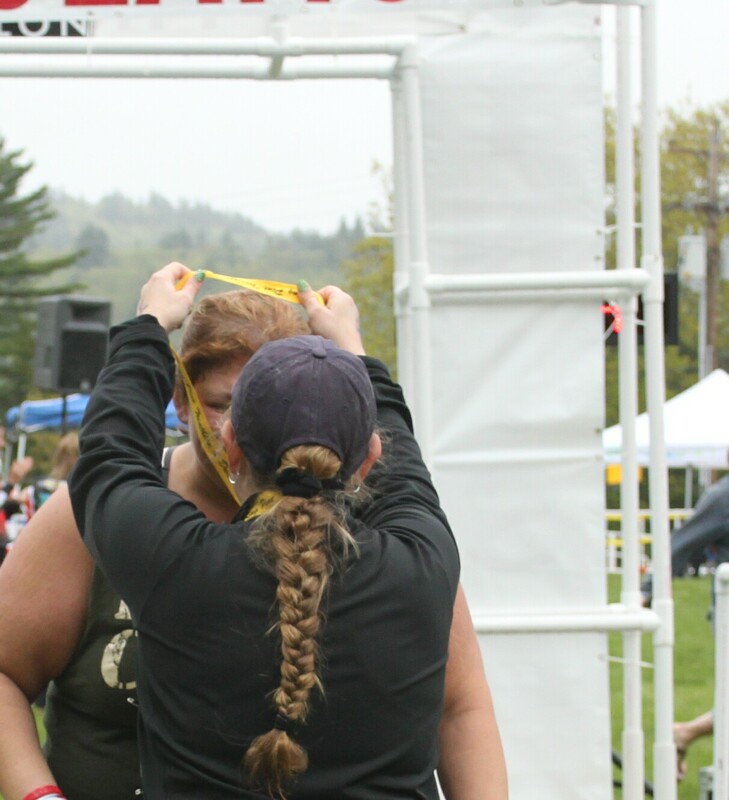 I LOVE FINISHER MEDAL RACES! I'm not a nicknack gal, but I really love the medals! I then turned to the timing team and asked if #87 had made it yet. 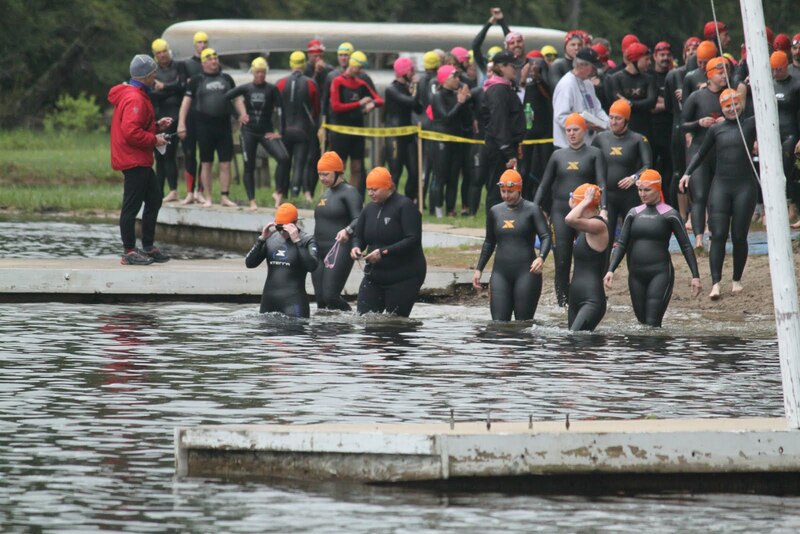 I REALLY wanted to be a part of Christina's becoming a Triathlete. They said "nope, but she's on her way." - they radio each other the last folks #s.. (yea they always have my #)! The people there told me I was allowed to put her medal over her head for her! Normally they just hand it to you, I figured I'd want this too! WAY COOL! VERY VERY cool actually! I saw her coming in the shoot her friends erupted with emotion! She erupted with emotion, it was like those 100lbs were dropped right there! She showed us all how strong she was. Each step was stronger and stronger. It was like a lion ready to pounce or something. 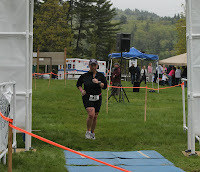 Closer and closer to the finish line... then one more step to becoming a triathlete. I actually got to say to her "Congratulations Christina, you are now a TRIATHLETE." Amazing Job Christina! Just Amazing! What an inspirational story. It's great that you were able to participate in her victory. It must have meant so much to her. Finishing is one thing, but having a "stranger" help commemorate your success would make it even sweeter! Bad @ss or Just Plain Crazy! 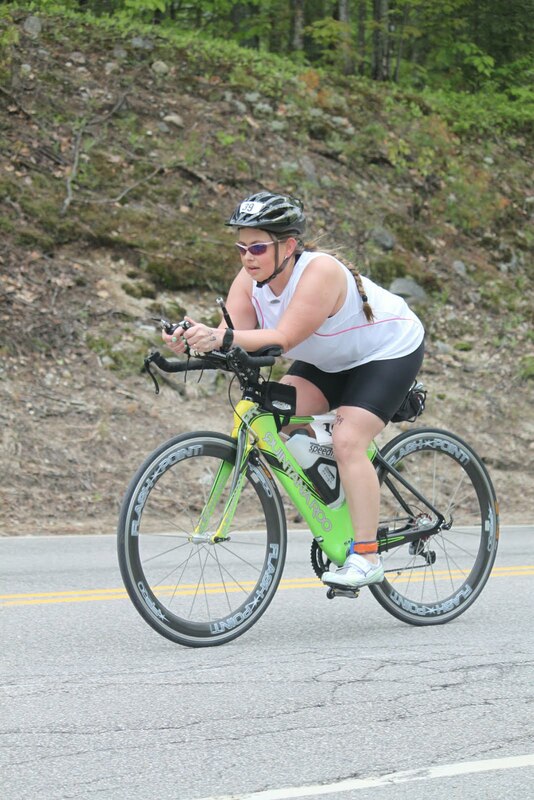 I'm a Triathlete and I have EDS!